Background: The association between antecedent head injury and AD is inconsistent. Objective: To examine the association between early adult head injury, as documented by military hospital records, and dementia in late life; and to evaluate the interaction between head injury and APOE ε4 as risk factors for dementia. Methods: The study had a population-based prospective historical cohort design. It included men who were World War II Navy and Marine veterans, and were hospitalized during their military service with a diagnosis of either a nonpenetrating head injury or another unrelated condition. In 1996 to 1997, military medical records were abstracted to document the occurrence and details of closed head injury. The entire sample was then evaluated for dementia and AD using a multistage procedure. There were 548 veterans with head injury and 1228 without head injury who completed all assigned stages of the study. The authors estimated risk of dementia, specifically AD, using proportional hazards models. Results: Both moderate head injury (hazard ratio [HR] = 2.32; CI = 1.04 to 5.17) and severe head injury (HR = 4.51; CI = 1.77 to 11.47) were associated with increased risk of AD. Results were similar for dementia in general. The results for mild head injury were inconclusive. When the authors stratified by the number of APOE ε4 alleles, they observed a nonsignificant trend toward a stronger association between AD and head injury in men with more ε4 alleles. Conclusions: Moderate and severe head injuries in young men may be associated with increased risk of AD and other dementias in late life. However, the authors cannot exclude the possibility that other unmeasured factors may be influencing this association. Methodologic problems limit the interpretation of much of the prior work on head injury and dementia. Most studies have relied on retrospective recall of head injury, which is susceptible to both random error and bias as individuals are often asked to recall events that occurred decades earlier. For individuals with cognitive impairment, the history of head injury must typically come from a proxy informant whose information may be even less certain. Attempts to find a dose-response relationship have been similarly limited by the use of recalled information about duration of loss of consciousness, and by the lack of an agreed standard method for assessing severity of the injury. We attempted to remedy these limitations by using a prospective historical cohort design to investigate the association between nonpenetrating head injury, as documented by military medical records, and AD or other dementias as ascertained by a multistage detection and assessment protocol. We also examined dose-response effects using an adaptation of a published rating scale for severity of closed head injury. Participants were World War II US Navy or Marine male veterans who had served in the military during 1944 to 1945 and were hospitalized during their military service with a diagnosis of 1) head injury, 2) pneumonia, or 3) laceration, puncture, or incision wounds. The Medical Follow-up Agency of the Institute of Medicine provided service numbers for veterans who had the qualifying diagnostic codes recorded on their military “F-cards.” The F-cards provided a composite report of hospital admissions and discharges within a given year. We next requested that the service numbers be matched to names and other identifying information from the Beneficiary Identification and Records Locator System and Compensation and Pension databases of the Department of Veterans Affairs. In this way, we identified 4022 putatively unexposed men with diagnoses of pneumonia (n = 1740) or of laceration or other wound (n = 2282), and 4509 with diagnostic codes suggesting closed head injury. We obtained military medical records for 3460 of these latter, putatively exposed veterans from the Department of Defense National Personnel Records Center. Medical record abstracting and other verification of exposure classification. Trained staff abstracted the military medical records for information about the head injuries, including cause of injury and duration of loss of consciousness or post-traumatic amnesia. Men were then considered “exposed” if they had experienced head trauma that 1) was documented in the military medical records, 2) occurred during military service, 3) produced loss of consciousness, post-traumatic amnesia, or skull fracture, 4) did not penetrate the dura mater, and 5) did not result in marked cognitive impairment or neurologic sequelae more than 3 months post-trauma. “Marked” sequelae were those likely to cause substantial limitation in activities of daily living. Detailed description of the head injury was sometimes sparse. In the absence of documented loss of consciousness or amnesia, we included men with military diagnoses of head injury who were hospitalized for symptoms consistent with head trauma. In questionable instances, a senior investigator made a decision about eligibility before we contacted the subject. After medical record review, 1422 of the 3460 putatively exposed veterans met criteria for head injury. Reasons for exclusion included: 1) the medical record lacked evidence of head injury (n = 1149), loss of consciousness, post-traumatic amnesia, or hospitalization for head trauma (n = 238); 2) the only reported head injury was before enlistment and sufficient documentation was not available to verify the injury (n = 189); 3) the record documented a penetrating head injury, depressed skull fracture, brain surgery, or severe neurologic sequelae (n = 78); 4) the individual was female or not in the armed services during 1944 to 1945 (n = 305); or 5) the individual died during military service (n = 79). We rated the severity of the head injuries using a modification of the scale of Frankowski et al.,15 which eliminated consideration of evidence (not available in the 1940s) of cerebral contusion, laceration, or intracranial hematoma. The resulting categories were as follows: 1) mild injury = loss of consciousness or post-traumatic amnesia for less than 30 minutes, with no skull fracture; 2) moderate injury = loss of consciousness or post-traumatic amnesia for more than 30 minutes but less than 24 hours, and/or a skull fracture; and 3) severe injury = loss of consciousness or post-traumatic amnesia for more than 24 hours. For financial reasons, we did not abstract the military medical records of men in the putatively unexposed group. Among the putatively unexposed participants, we excluded as ineligible a total of 404 men whose initial interview or later assessment procedures (see below) revealed a lifetime history of head injury with loss of consciousness. We also excluded four exposed men because they reported a penetrating head injury or brain surgery after military service. 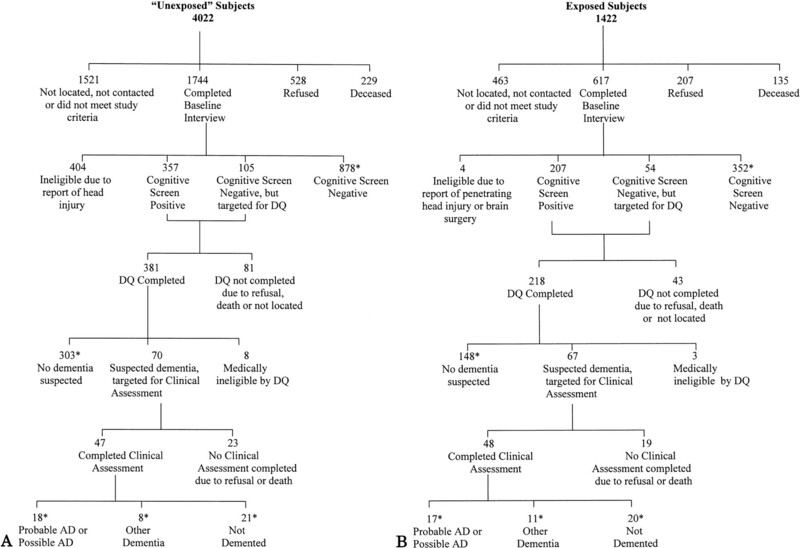 Tracing of subjects, screening, and assessment for dementia. Remaining blind at all times to the participants’ membership in either the exposed or putatively unexposed groups, we next applied identical tracing, screening, and assessment procedures to both groups. Figure 1 shows the number of subjects that participated at each phase of the study for both groups. We searched several commercial databases for current addresses and phone numbers for the subjects. From the initial pool of 5444 veterans, 2361 were located and agreed to participate in the initial interview. Rates of participation were similar in the exposed and unexposed groups (see figure 1). Ninety-five percent of these veterans were Caucasian, 3.5% were African American, and the remaining 1.5% were from other races. All procedures were approved by the Institutional Review Board at Duke University Medical Center. Informed consent was obtained at each stage of the protocol. Figure 1. Flow chart shows disposition of the putatively unexposed (A) and exposed (B) participants. DQ = Dementia Questionnaire. Participants included in the final analyses are noted by an asterisk. We identified men with dementia using a three-stage screening and assessment protocol. Trained lay interviewers first administered a 35-minute telephone interview to all respondents. The interview included a modified version of the Telephone Interview for Cognitive Status (TICS-m),16,17⇓ an instrument based closely on the Mini-Mental State Examination.18 The interview also included questions about medical history (including lifetime history of head injury) and occupational history. Some subjects were unable to complete the TICS-m or answer the other questions because they were demented, aphasic, medically ill, or had a profound hearing deficit. In these instances, we interviewed a knowledgeable informant (usually a wife or adult child) to obtain a rating of the subject’s cognitive and functional abilities using the Informant Questionnaire for Cognitive Decline (IQCODE),19 as well as proxy responses to the other questions. We applied education-adjusted cut-points for the TICS-m as established in previous studies.20 Men with an education-adjusted TICS-m score of less than 29 or an IQCODE score above the published cut-off of 3.2719 were considered to have suspected cognitive impairment. We therefore invited them to participate in a second stage of screening, which entailed administering the telephone Dementia Questionnaire (DQ)21,22⇓ to a knowledgeable informant. The DQ enumerates symptoms of dementia and relevant medical and family history, thus improving specificity in dementia screening.20,23⇓ To increase sensitivity of the multistage screening method, we sought a DQ for approximately 10% of the subjects with an education-adjusted TICS-m score ≥29. These men were identified using an item discriminant score from an algorithm developed in previous work to predict individuals who subsequently developed AD. In addition, about 20% of the subjects with an IQCODE score <3.27 were targeted for a DQ after careful clinical review of the answers to IQCODE items. These criteria were designed to identify men at greater risk of being demented. Information about head injury was removed from the DQ before it was reviewed and rated for evidence of cognitive impairment. The DQ information led to the exclusion of 11 subjects (eight unexposed, three exposed) who had conditions that prevented valid assessment of cognitive and functional abilities. These conditions included current alcohol abuse (n = 4), Parkinson’s disease (n = 2) or a single debilitating stroke that severely affected motor and language skills (n = 2), chronic psychiatric illness (n = 1), a brain tumor (n = 1), and end-stage renal disease (n = 1). We next invited men whose DQ results suggested dementia to undergo a clinical assessment administered by a research nurse and psychometric technician. During this assessment, the following information was obtained from a knowledgeable respondent: 1) detailed clinical history of cognitive and functional decline; 2) medical and psychiatric history; 3) lifetime history of the use of common medications; and 4) family history of dementia. Procedures with each veteran included: 1) brief physical assessment and standardized neurologic examination; 2) neuropsychological testing; 3) collection of buccal DNA for APOE genotyping; and 4) a brief videotape segment of portions of the neurologic and cognitive status examinations. Details of the neuropsychological battery have been published elsewhere.24 Briefly, it included the CERAD battery supplemented by tests of visual and verbal memory, executive function, vocabulary, and sensorimotor function. We also requested medical records of evaluations for cognitive impairment and related disorders from participants’ personal physicians. Seven men either refused the in-person assessment or were deceased, but the veteran or his authorized representative (when the subject was deceased) granted permission for the release of relevant medical records that were sufficient to assign a diagnosis. We reviewed all information from the clinical assessments and medical records at case conferences that included a board-certified geriatric psychiatrist (D.C.S. or J.C.S.B. ), a cognitive neuroscientist (B.L.P. ), and the assessment team. We assigned preliminary diagnoses at these conferences using National Institute of Neurological and Communicative Disorders and Stroke–AD and Related Disorders Association (NINCDS-ADRDA) criteria25 for AD, National Institute of Neurological Disorders and Stroke–Association Internationale pour la Recherche et l’Enseignement en Neurosciences criteria26 for vascular dementia (VaD) as operationalized by Tatemichi et al.,27 and DSM-III-R criteria28 for dementia. To capture multiple apparent causes of dementia, we assigned a primary and secondary diagnosis when needed. For example, individuals could be assigned a primary diagnosis of possible VaD and a secondary diagnosis of possible AD. We estimated age at onset of dementia (age at which subjects unambiguously met DSM-IIIR criteria for dementia) based on a systematic review of the chronology of cognitive and functional symptoms. We used a structured telephone interview to collect longitudinal information approximately 8 to 12 months after the clinical assessments of men with diagnoses of mild cognitive impairment, mild dementia, or other syndromes for which longitudinal information seemed likely to clarify the diagnosis. We then reviewed each case for assignment of final diagnosis at a consensus conference attended by board-certified geropsychiatrists (D.C.S. and J.C.S.B. ), a neurologist (J.R.B. ), a neuropsychologist (K.A.W.-B. ), and a cognitive neuroscientist (B.L.P.). The investigators who assigned the diagnoses were unaware of each participant’s membership in the exposed or unexposed group. However, consistent with standard clinical procedures, we did have access to a retrospective history of head injury that was gathered from informants at the time of the clinical assessment. These assessment and diagnostic procedures have been used in similar studies for 10 years and there is accumulating evidence of their utility. Our previous work20,29⇓ has shown that the application of a critical cut-point on the TICS-m or a similar cognitive screening instrument (i.e., the Modified Mini-Mental State Examination) in combination with the DQ yields sensitivity and specificity values greater than 90% for the detection of dementia. For the IQCODE and DQ combined, the sensitivity was 100% and the specificity was 17%, but the latter value is based on very small numbers (unpublished data). In the current study, we modified the screening protocol to further reduce the likelihood that any cases of dementia were overlooked. We increased the cut-point for the TICS-m by one point, which resulted in more participants being targeted for administration of the DQ. We also targeted for a DQ a proportion of participants who screened negative on the TICS-m and IQCODE. As described above, these additional men were targeted for a DQ using criteria to identify those at particular risk of AD. The validity of our differential diagnoses for participants with dementia has been assessed by comparing the clinical diagnoses obtained using the above described assessment procedures with subsequent neuropathologic diagnoses. Combining (unpublished) data from our multiple studies,23 we now have autopsies on 70 study participants. Comparing our clinical diagnoses with the autopsy results, the sensitivity was 85% and the specificity was 55%. The sensitivity increased to 93% when we excluded individuals with a clinical diagnosis of “dementia, questionable etiology” and a subsequent pathologic diagnosis of “definite AD.” This approach is justified because by definition, the diagnosis of dementia, questionable etiology includes AD in the differential. The specificity increased to 75% when we excluded two individuals with a clinical diagnosis of AD and a neuropathologic diagnosis of Lewy body disease (considered by some to be a subtype of AD) and another individual who had both clinical and neuropathologic primary diagnoses of VaD, but the clinical diagnosis included a secondary diagnosis of AD, which was not confirmed at autopsy. Overall, these values are similar to those found in other studies30,31⇓ from specialty dementia clinics. To determine APOE genotype, we collected buccal samples from subjects at the time of the clinical assessment. To provide a comparison group of individuals who did not have suspected dementia, we also collected DNA samples from a subset of participants using a pilot-tested protocol of self-collected buccal scrapings that were then returned by mail. The latter subjects were randomly selected in equal proportions from the exposed and unexposed groups using weighted samples from strata of TICS-m and IQCODE scores. APOE genotype was determined using PCR amplification and a restriction isotyping method.32 Altogether, we obtained APOE genotypes from 46 of the 54 demented subjects, and from 356 nondemented subjects. APOE genotypes were withheld from the clinicians during the diagnostic process. To estimate the risk of AD and dementia associated with a history of head injury, we used proportional hazards methods to model age at onset, current age, or age at death. The models included years of education and sometimes age as covariates. To assess whether the proportional hazards analyses gave misleading results because they relied on our retrospective estimates of onset age, we also examined the same associations using multiple logistic regression analyses. Because both analytical approaches yielded similar results, we present only the results from the more sensitive proportional hazards analyses here. We also used proportional hazards models to assess the effect of severity of head injury on risk of AD and dementia, and to test for an interaction between head injury, APOE ε4, and AD or dementia. To test for a trend effect of severity of head injury on AD and dementia, we parameterized severity of head injury into four increasing levels of severity (i.e., none, mild, moderate, severe) in a proportional hazards model and used the test of significance of the fitted coefficient as a measure of a significant linear component (trend). We used t-tests and analyses of variance to compare the characteristics of participants and refusals, and to compare various characteristics of the exposed and unexposed groups. We used a Mantel–Haenszel test to assess the trend effect between severity of head injury and likelihood that the participant or proxy reported the head injury during the baseline interview. Thirty-eight nondemented subjects were excluded from the analyses on severity of head injury because loss of consciousness or post-traumatic amnesia was either not documented or there were no details on duration of these conditions. Table 1 shows characteristics of participants and those who refused each stage of assessment. Among the listed comparisons, only three reached significance. In the exposed group, there was no difference in the severity of the head injury between those who completed the initial interview, those who were deceased, and those who refused the interview (χ2 = 1.523, df = 4, p = 0.82). Table 2 presents demographic information for the exposed and unexposed participants by dementia status. Within the exposed and unexposed groups, the nondemented subjects were younger than either the demented subjects (p = 0.0001) or those with AD (p = 0.0001). Among the nondemented subjects, unexposed subjects were slightly younger than the exposed subjects (p = 0.0003). The various groups did not differ significantly in years of education. Risk of AD and dementia with head injury and with APOE ε4. History of head injury (based on medical record documentation) increased the risk of AD (hazard ratio [HR] = 2.00, 95% CI = 1.03 to 3.90) and dementia (HR = 2.23, 95% CI = 1.30 to 3.81). When age was added to the model, the HR remained the same for AD (HR = 2.01, 95% CI = 1.03 to 3.91) and dementia (HR = 2.23, 95% CI = 1.30 to 3.81), and the coefficient for age was not significant for AD (p = 0.39) or dementia (p = 0.93). Logistic analyses produced similar results with estimated OR of 2.16 (95% CI = 1.10 to 4.23) for history of head injury and AD and 2.46 (95% CI = 1.43 to 4.24) for head injury and dementia. When the demented group was limited to those without a primary diagnosis of AD (n = 21), head injury was still associated with increased risk of dementia (HR = 3.23, 95% CI = 1.33 to 7.82). Figure 2 shows that the risk of AD and dementia increased with severity of head injury (test for trend, p = 0.0013 for AD and p < 0.0001 for dementia). For those with AD, 2 men had mild head injuries, 9 had moderate injuries, and 6 had severe injuries. For those with any type of dementia, 5 had mild injuries, 14 had moderate injuries, and 9 had severe injuries. Compared with the group with no head injury, there was increased risk of AD (HR = 2.32, 95% CI = 1.04 to 5.17) and dementia (HR = 2.39, 95% CI = 1.24 to 4.58) in those with moderate head injury. Likewise, severe head injury was associated with increased risk of AD (HR = 4.51, 95% CI = 1.77 to 11.47) and dementia (HR = 4.48, 95% CI = 2.09 to 9.63). However, the mildly head-injured group showed no significant risk of AD (HR = 0.76, 95% CI = 0.18 to 3.29) or dementia (HR = 1.33, 95% CI = 0.51 to 3.47) compared to the non–head-injured group. When age was added to the models, the HR did not change. When the demented group was limited to men without a primary diagnosis of AD, those with moderate head injury (HR = 3.11, 95% CI = 1.08 to 9.00) and severe head injury (HR = 6.48, 95% CI = 1.94 to 21.64) were at greater risk for dementia compared with those with no head injury. Again, the mildly head-injured participants in this subgroup showed no significant increase in risk of dementia (HR = 2.56, 95% CI = 0.68 to 9.67). Similar results were found in all instances when we made these comparisons using multiple logistic analyses. Figure 2. 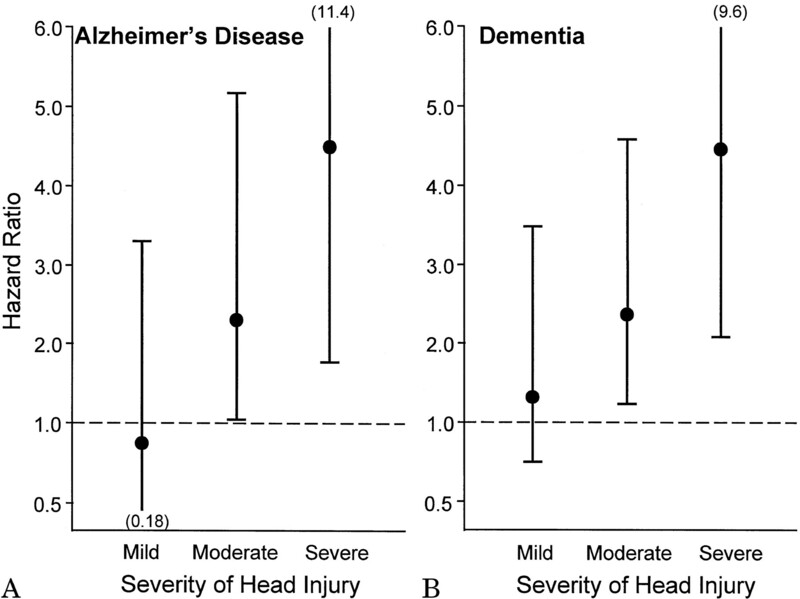 Hazard ratios for severity of head injury and AD (A) and all types of dementia (B). Bars represent 95% CI. To explore whether the increased risk of AD and dementia was attributable to multiple head injuries either during military service or during civilian life, we also calculated the HR after excluding all men who had more than one injury documented in their medical records or who reported additional head injuries during the baseline interview (total n = 148). The results were similar to those reported above. Compared with the group with no head injury, there was increased risk of AD (HR = 2.92, 95% CI = 1.26 to 6.75) and dementia (HR = 2.86, 95% CI = 1.44 to 5.71) in those with moderate wartime head injury. Severe head injury was associated with increased risk of AD (HR = 4.59, 95% CI = 1.69 to 12.46) and dementia (HR = 4.23, 95% CI = 1.82 to 9.80). However, the mildly head-injured group showed no notable risk of AD (HR = 1.23, 95% CI = 0.28 to 5.31) or dementia (HR = 1.71, 95% CI = 0.59 to 4.90) when compared to the non–head-injured group. Group mean ages at onset are provided in table 2. In comparisons using t-tests, the exposed and unexposed group did not differ on age at onset for AD (p = 0.31) or for all types of dementia (p = 0.09). Likewise, the comparison between the unexposed group and men with mild, moderate, or severe head injury showed no difference for age at onset for AD (p = 0.32) or for dementia (p = 0.8). As expected, the APOE ε4 allele frequency was higher among all participants with AD (0.28 versus 0.16; χ2 = 6.50, df = 1, p = 0.011) or dementia (0.30 versus 0.16; χ2 = 12.56, df = 1, p = 0.001) compared with those without dementia. In a model that included head injury and years of education as covariates, the HR for AD associated with homozygous ε4 was 13.97 (95% CI = 4.64 to 42.01) and for ε4 heterozygotes was 1.03 (95% CI = 0.43 to 2.50). Both comparisons used men with no ε4 as a reference group. For all dementias, the corresponding HR were 10.15 (95% CI = 4.17 to 24.73) and 1.40 (95% CI = 0.72 to 2.72). Table 3 shows a trend toward an increased association between AD and head injury in the presence of more ε4 alleles. However, none of the individual HR in this table achieved significance. We then used proportional hazards models to examine the independent and combined effects of head injury and APOE ε4 on risk of AD and dementia, while controlling for education. Compared with a reference group of those with no head injury and no ε4 allele, the HR for AD with head injury alone was 0.67 (95% CI = 0.26 to 1.72). With any ε4 allele alone it was 1.30 (95% CI = 0.45 to 3.80), and for both head injury and any ε4 allele it was 1.49 (95% CI = 0.57 to 3.89). Similar calculations for all types of dementia yielded HR of 0.91 (95% CI = 0.41 to 2.00) with head injury alone, 1.76 (95% CI = 0.75 to 4.17) with any ε4 allele alone, and 2.01 (95% CI = 0.91 to 4.42) with both head injury and any ε4 allele. There was no interaction effect between head injury and APOE ε4 on risk of AD (p = 0.71) or dementia (p = 0.48). We performed several analyses to investigate alternate explanations for the above findings. Using a proportional hazards model and controlling for education, we found no difference in the association of AD (χ2 test of coefficient = 0.39, df = 1, p = 0.54) or dementia (χ2 test of coefficient = 0.02, df = 1, p = 0.89) with head injuries that were sustained in combat versus noncombat settings. Using the head-injured as the reference group, there was no difference in the risk of AD (χ2 = 0.26, df = 1, p = 0.61) or dementia (χ2 = 0.15, df = 1, p = 0.69) for those with a military hospital discharge diagnosis of pneumonia versus laceration or wound. Also, the frequency of a positive family history of dementia did not differ in the exposed and unexposed groups with AD (χ2 = 0.846, df = 1, p = 0.358) or dementia (χ2 = 1.114, df = 1, p = 0.291). When we included a history of alcohol abuse or extensive history of tobacco use as covariates in the proportional hazards models, the association between head injury and AD or dementia was not noticeably changed. Finally, we considered whether the clinicians who assigned the diagnoses might have been biased by the clinical history information on prior head injury. Among the exposed group, 51% with a reported clinical history of head injury were assigned a diagnosis of dementia compared with 77% of those for whom head injury was not reported at the clinical assessment. In the unexposed group, 43% of those for whom head injury was reported at the clinical assessment were assigned a diagnosis of dementia (this group was not included in subsequent analyses) compared with 53% of those with no reported history of head injury. To assess recall error, we calculated the proportion of subjects with documented wartime head injury who reported it years later. At the time of the initial interview, 69% of the exposed subjects who provided self-reported information noted a history of head injury, and 65% of the proxy informants reported a head injury for the subject. Both the subjects’ (Mantel–Haenszel test for trend χ2 = 4.87, df = 1, p = 0.027) and proxies’ (Mantel–Haenszel test for trend χ2 = 16.66, df = 1, p = 0.001) reports of prior head injury was positively associated with the severity of the injury. Using a published severity scale, we also found that the risk of AD and dementia increased with severity of head injury. Only those with moderate or severe head injury had a significantly increased risk of AD or dementia. The results for mild head injury were inconclusive. Mild head injury appeared to increase the risk of dementia (but not AD), but these HR did not meet the standard threshold for significance. The observed dose-response pattern may support a causal effect of head injury in the pathogenesis of AD and dementia.33 Curiously, when those who were reported to have had multiple head injuries were excluded, the risk of AD and dementia did not diminish. A possible explanation for this is that most of the information on multiple injuries was based on retrospective recall. We have already noted that this source of information is prone to error. One prior study34 suggested that APOE ε4 and head injury act synergistically to increase risk of AD, but others have reported that they act additively.5,14⇓ Our data are ambiguous on this point, especially given our atypical finding that ε4 heterozygotes showed no significant increase in risk of AD or dementia. As did other investigators, we lacked adequate statistical power to show whether the risk with head injury differed by number of ε4 alleles. Another earlier study9 also used medical records to document head injury, but reported no associated increase in risk of dementia. However, a later reanalysis35 of that study used an expanded dataset and time-sensitive methods to show accelerated AD onset (less time between head injury and AD onset) before age 75. Our study also used time-dependent analyses but, whereas the previous study used medical record review to diagnose dementia, we used a systematic screening protocol and a standardized in-person evaluation. Results from these time-dependent analyses suggest that an important result of head injury may be acceleration of dementia onset. However, using simple t-tests, we could not replicate other reports suggesting that head injury is related to earlier onset of dementia.7,35,36⇓⇓ Others have reported that an increase in the incidence and prevalence of AD is associated only with head injuries occurring within the previous 10 to 30 years.3,7⇓ Our findings suggest that the risk of dementia is increased even when a head injury was sustained 40 to 50 years earlier. If anything, the risk of dementia associated with head injury was stronger after we excluded men with a primary diagnosis of AD. This finding is consistent with one prior report1 suggesting that the dementia risk associated with head trauma is not specific to AD. Curiously, the frequencies of other types of dementia differed in the exposed and unexposed groups. The majority (77%) of exposed men, but only a small fraction of unexposed veterans with non-AD dementia, had VaD. If replicated in a larger sample, this finding could suggest that head injury triggers a pathogenic process that is common to both AD and VaD. Some caution is warranted in interpreting our findings. As would be expected with any study that used 50-year-old military medical records to identify the sample, there was attrition at all phases of the study. Such attrition would represent a threat to the integrity of our results if there was selective attrition based on head injury status (e.g., if a higher proportion of demented “unexposed” participants were missed). Comparisons of participants and nonparticipants in the study did not suggest such differential attrition based on head injury status, but we cannot rule out that some cases of dementia were overlooked, and that this may have altered our results somewhat. Another point to consider is that these men were “exposed” to many factors between the time of their head injury and the onset of dementia. We assessed some of these factors (e.g., history of smoking and alcohol intake) and did not find that they altered the association between head injury and dementia. However, we cannot rule out that other intervening factors may have altered this association. Each year an estimated 1.5 to 2 million individuals in the United States experience a significant head injury.37 The most severe injuries result in death or long-term disability, but less severe injuries result in 300,000 hospital admissions each year. Our findings should add impetus to recommendations from a recent National Institutes of Health Consensus Conference on improved approaches to the prevention and treatment of traumatic brain injury.37 The findings may also have implications for the etiology of dementias. The veterans in this study sustained head injuries in early adult life. Their risk of dementia 50 years later suggests that pathogenesis of the degenerative dementias may trace to origins decades before the appearance of clinical symptoms. This result is consistent with the perspective that AD is a chronic disease that unfolds over many decades, with an extended latent phase as well as a prodromal stage (progressive “age-related cognitive decline”) and the stage of fully expressed dementia.38 Others have reported that APOE ε4 may begin its destructive work as early as the third or fourth decade of life, and this work suggests that head injury may have similar consequences.39 Understanding both effects should lead to improved understanding of the pathogenesis of dementia,40 which could well lead to interventions that retard or arrest the process early in its course. The authors thank the Bryan Alzheimer’s Disease Research Center at Duke University for performing the APOE genotyping for this study, and the staff of the Program in Epidemiology of Dementia at Duke University Medical Center for their many efforts on this project. Study completed under contract N01-AG-4-2142 from the National Institute on Aging, National Institutes of Health. Salib E, Hillier V. Head injury and the risk of Alzheimer’s disease: a case control study. Int J Geriatr Psychiatry . 1997; 12: 363–368. van Duijn CM, Tanja TA, Haaxma R, et al. Head trauma and the risk of Alzheimer’s disease. Am J Epidemiol . 1992; 135: 775–782. Mortimer JA, van Duijn CM, Chandra V, et al. Head trauma as a risk factor for Alzheimer’s disease: a collaborative re-analysis of case-control studies. Int J Epidemiol . 1991; 20 (suppl 2): S28–S35. Mayeux R, Ottman R, Tang M-X, et al. Genetic susceptibility and head injury as risk factors for Alzheimer’s disease among community-dwelling elderly persons and their first-degree relatives. Ann Neurol . 1993; 33: 494–501. O’Meara ES, Kukull WA, Sheppard L, et al. Head injury and risk of Alzheimer’s disease by apolipoprotein E genotype. Am J Epidemiol . 1997; 146: 373–384. Graves AB, White E, Koepsell TD, et al. The association between head trauma and Alzheimer’s disease. Am J Epidemiol . 1990; 131: 491–501. Schofield PW, Tang M, Marder K, et al. Alzheimer’s disease after remote head injury: an incidence study. J Neurol Neurosurg Psychiatry . 1997; 62: 119–124. Heyman A, Wilkinson WE, Stafford JA, et al. Alzheimer’s disease: a study of epidemiological aspects. Ann Neurol . 1984; 15: 335–341. Williams DB, Annegers JF, Kokmen E, O’Brien PC, Kurland LT. Brain injury and neurologic sequelae: a cohort study of dementia, parkinsonism, and amyotrophic lateral sclerosis. Neurology . 1991; 41: 1554–1557. Katzman R, Aronson M, Fuld P, et al. Development of dementing illnesses in an 80 year old volunteer cohort. Ann Neurol . 1989; 25: 317–324. Launer LJ, Andersen K, Dewey ME, et al. Rates and risk factors for dementia and Alzheimer’s disease. Neurology . 1999; 52: 78–84. Mehta KM, Ott A, Kalmijn S, et al. Head trauma and risk of dementia and Alzheimer’s disease. Neurology . 1999; 53: 1959–1962. Mayeux R. Apolipoprotein ε4 and head trauma: synergistic or additive risks? Neurology . 1996; 46: 889–891. Letter. Katzman R, Galasko DR, Saitoh T, et al. Apolipoprotein ε4 and head trauma: synergistic or additive risks? Neurology . 1996; 46: 889–891. Letter. Frankowski RF, Annegers JF, Whitman S. Epidemiological and descriptive studies. Part I: The descriptive epidemiology of head trauma in the United States. In: Becker DP, Povlishock JT, eds. Central nervous system trauma status report–1985. Bethesda, MD: National Institute of Neurological and Communicative Disorders and Stroke, 1985: 33–43. Brandt J, Spencer M, Folstein M. The Telephone Interview for Cognitive Status. Neuropsychiatry Neuropsychol Behav Neurol . 1988; 1: 111–117. Welsh KA, Breitner JCS, Magruder–Habib KM. Detection of dementia in the elderly using telephone screening of cognitive status. Neuropsychiatry Neuropsychol Behav Neurol . 1993; 6: 103–110. Folstein MF, Folstein SE, McHugh PR. Mini-Mental state. A practical method for grading the cognitive state of patients for the clinician. J Psychiatr Res . 1975; 12: 189–198. Jorm AF, Jacomb PA. The Informant Questionnaire on Cognitive Decline in the Elderly (IQCODE): socio-demographic correlates, reliability, validity and some norms. Psychol Med . 1989; 19: 1015–1022. Gallo JJ, Breitner JCS. Alzheimer’s disease in the N.A.S.- N.R.C. registry of aging twin veterans. IV. Performance characteristics of a two-stage telephone screening procedure for Alzheimer’s dementia. Psychol Med . 1995; 25: 1211–1219. Silverman JM, Breitner JCS, Mohs RC, Davis KL. Reliability of the family history method in genetic studies of Alzheimer’s disease and related dementias. Am J Psychiatry . 1986; 143: 1279–1282. Kawas C, Segal J, Stewart WF, Corrada M, Thal LJ. A validation study of the dementia questionnaire. Arch Neurol . 1994; 51: 901–906. Breitner JCS, Wyse BW, Anthony JC, et al. APOE-ε4 count predicts age when prevalence of AD increases, then declines: the Cache County Study. Neurology . 1999; 53: 321–331. Breitner JCS, Welsh KA, Gau BA, et al. Alzheimer’s disease in the National Academy of Sciences–National Research Council Registry of aging twin veterans. III. Detection of cases, longitudinal results, and observations on twin concordance. Arch Neurol . 1995; 52: 763–771. McKhann G, Drachman D, Folstein M, et al. Clinical diagnosis of Alzheimer’s disease: report of the NINCDS-ADRDA Work Group under the auspices of the Department of Health and Human Services Task Force on Alzheimer’s Disease. Neurology . 1984; 34: 939–944. Tatemichi TK, Sacktor N, Mayeux R. Dementia associated with cerebrovascular disease, other degenerative diseases, and metabolic disorders. In: Terry RD, Katzman R, Bick KL, eds. Alzheimer disease. New York, NY: Raven Press, 1994: 123–166. American Psychiatric Association. Diagnostic and statistical manual of mental disorders. Third edition–revised. Washington, DC: American Psychiatric Association, 1987. Khachaturian AS, Gallo JJ, Breitner JCS. Performance characteristics of a two-stage dementia screen in a population sample. J Clin Epidemiol 2000 (in press). Tsuang D, Larson EB, Bowen J, et al. The utility of apolipoprotein E genotyping in the diagnosis of Alzheimer’s disease in a community-based case series. Arch Neurol . 1999; 56: 1489–1495. Mayeux R, Saunders AM, Shea S, et al. Utility of the apolipoprotein E genotype in the diagnosis of Alzheimer’s disease. N Engl J Med . 1998; 338: 506–511. Saunders AM, Strittmatter WJ, Schmechel D, et al. Association of apolipoprotein E allele ε4 with late-onset familial and sporadic Alzheimer’s disease. Neurology . 1993; 43: 1467–1472. Hill AB. The environment and disease: association or causation? Proc R Soc Med . 1965; 58: 295–300. Mayeux R, Ottman R, Maestre G, et al. Synergistic effects of traumatic head injury and apolipoprotein-epsilon 4 in patients with Alzheimer’s disease. Neurology . 1995; 45: 555–557. Nemetz PN, Leibson C, Naessens JM, et al. Traumatic brain injury and time to onset of Alzheimer’s disease: a population-based study. Am J Epidemiol . 1999; 149: 32–40. Gedye A, Beattie BL, Tuokko H, Horton A, Korsarek E. Severe head injury hastens age of onset of Alzheimer’s disease. J Am Geriatr Soc . 1989; 37: 970–973. National Institutes of Health. Rehabilitation of persons with traumatic brain injury. NIH Consensus Statement 1998, Oct 26–28;16:1–41. Breitner JCS. The end of Alzheimer’s disease. Int J Geriatr Psychiatry . 1999; 14: 577–586. Ghebremedhin E, Schultz C, Braak E, Braak H. High frequency of apolipoprotein E ε4 allele in young individuals with very mild Alzheimer’s disease-related neurofibrillary changes. Exp Neurol . 1998; 153: 152–155. McIntosh TK, Saatman KE, Raghupathi R, et al. The molecular and cellular sequelae of experimental traumatic brain injury: pathogenetic mechanisms. Neuropathol Appl Neurobiol . 1998; 24: 251–267.